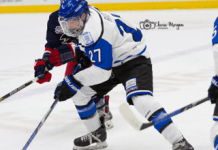 Victoria, BC- The Victoria Royals allowed three goals in the first period as they fell 5-1 to the Prince George Cougars on Saturday night at the Save-On-Foods Memorial Centre. For the second consecutive contest, the Royals were without regulars Jack Walker (Toronto Maple Leafs), Tyler Soy (Anaheim Ducks), Chaz Reddekopp (Los Angeles Kings) and Matthew Phillips (Calgary Flames) who were all attending NHL Main Training Camps. Prince George’s Kody McDonald registered two goals on the night. Victoria’s lone tally was recorded by Ethan Price. Royals’ netminder Griffen Outhouse started the contest before he was replaced by Dylan Myskiw midway through the first period. Myskiw made his WHL debut and turned aside 20 of the 22 shots fired his way in relief. Prince George goalie Nick McBride made 36 saves on 37 shots. Neither team could capitalize on the powerplay as both teams went 0/5=0.0%. The Royals will return to action on Friday, September 30th when they take on the Kamloops Blazers at the Save-On-Foods Memorial Centre with puck drop set for 7:05 p.m.